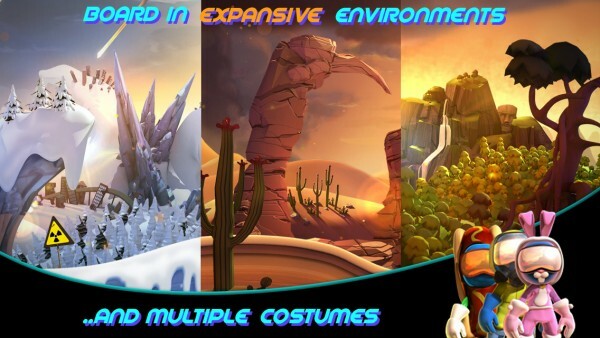 RAD Boarding (Free) by Noodlecake Studios Inc and Other Ocean is an endless apocalyptic snowboarding adventure that will keep you occupied for some time. 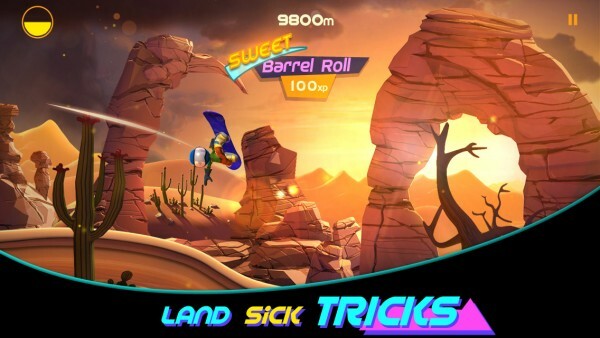 If you enjoyed games like Tiny Wings and Ski Safari, then Rad Boarding will be right up your alley, if you can get past some flaws. 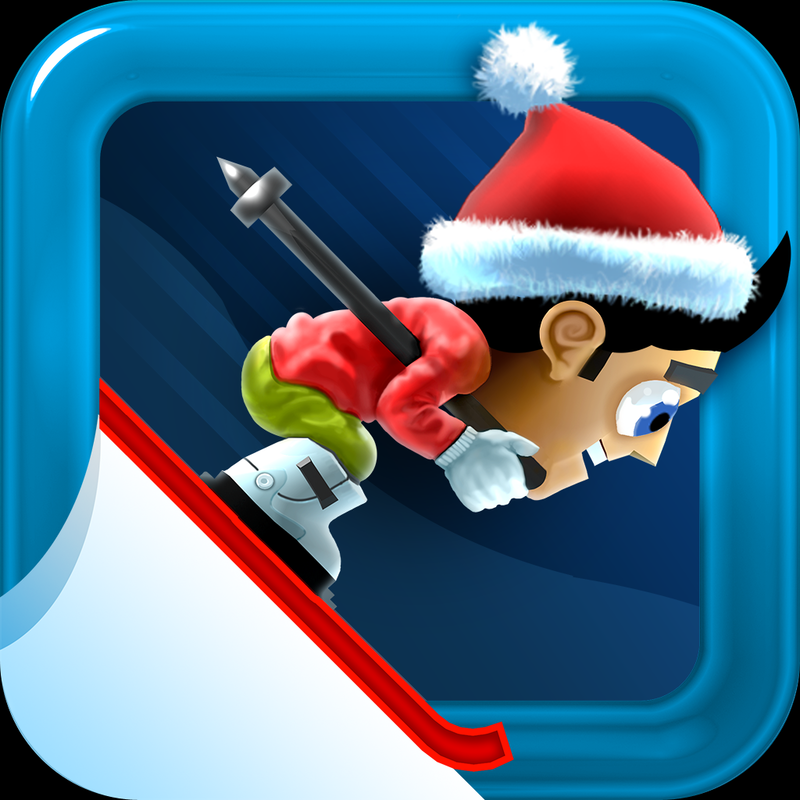 It seems that endless runners (or infinite snowboarders in this case) are making a comeback this year. 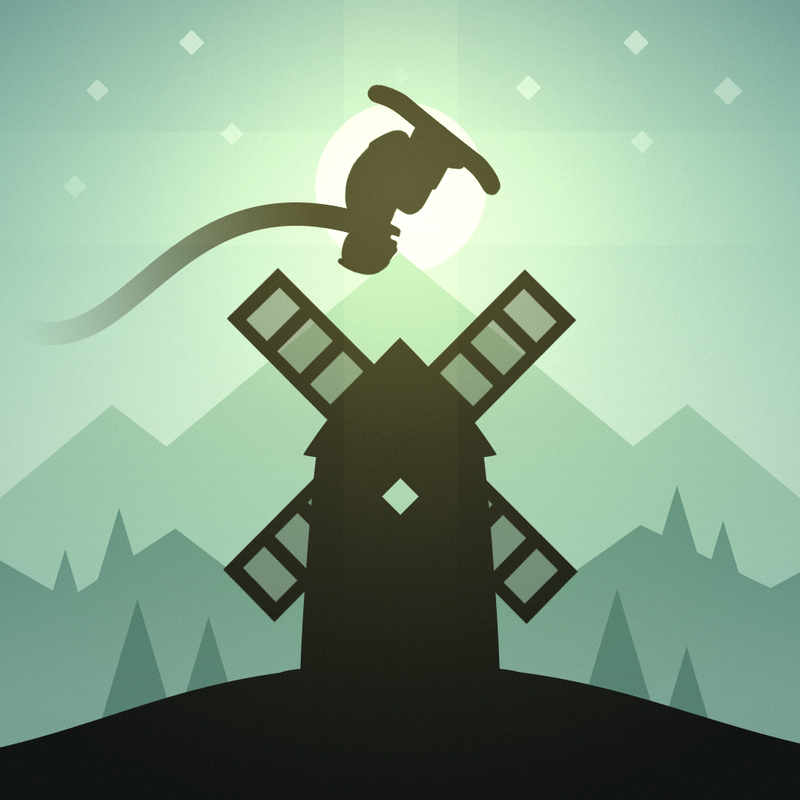 It started with Alto’s Adventure a few weeks ago, which was hailed as our Game of the Week after release. While it has been a while since I’ve been into the endless games prior to Alto’s, I admit that they are a fantastic time killer. When I first heard of Rad Boarding a few weeks ago, I was eager to check it out. Now that it’s here and I’ve spent a bit of time with it, I have to say that I’m a bit disappointed with how things are in the game. First off, the visuals in the game look gorgeous, if you don’t examine the backgrounds carefully. In the foreground, the game is beautiful with vibrant, lush environments and a lot of fine details strewn throughout. 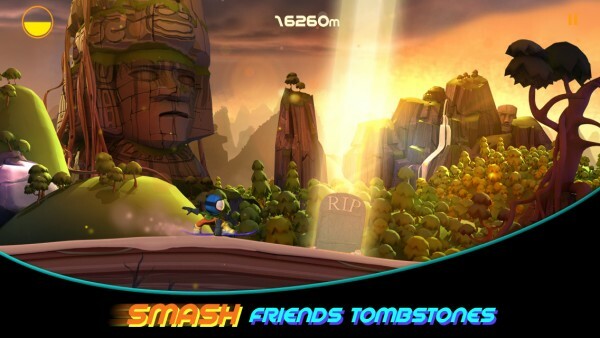 However, if you look at the background of the game, which is easier after you die, you’ll notice that the these graphics did not go fully HD — things look a bit jagged and rough, even a bit fuzzy. Let’s face it, in 2015, with our iPhone 6 and 6 Plus handsets, this isn’t really what I would consider acceptable from a game developer. I hope that the developers can optimize the graphics in the future. The game moves quickly, so at least the animations are smooth and fluid. 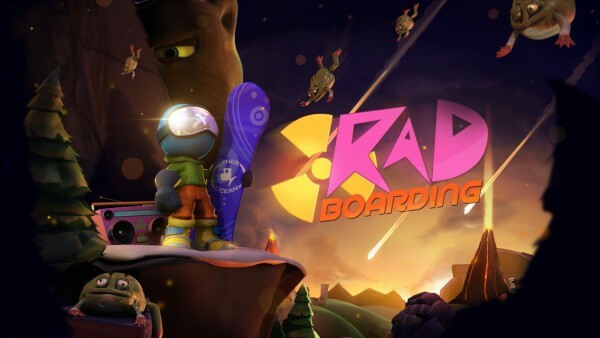 Rad Boarding comes with a quirky ’90s soundtrack that’s fun to listen to, but does get a bit boring over time. Hey, at least the guitar shredding bit when you hit Rad Mode is cool. 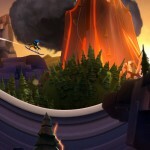 The goal of Rad Boarding is simple — help your snowboarder character escape the impending lava flow that is right on his heels. To do this, you’re going to have to snowboard down small and large hills alike, while doing sweet tricks to build up the rad meter. 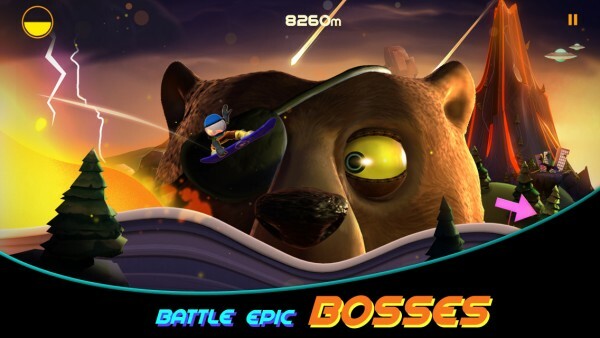 There are even “boss battles” that you’ll face, such as Tiny the bear with an eyepatch, though you won’t be fighting them. In order to “beat” them, you have to impress them with tricks. 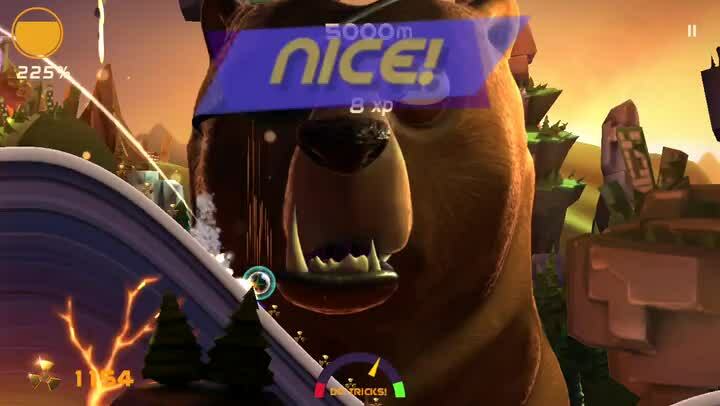 There are various goals to strive for in Rad Boarding, and completing these will net you experience points and rewards, such as coins or bottle caps. Leveling up means unlocking new tricks to your arsenal, making it easier to fill up the meter. When you enter Rad Mode, the lava slows down a bit, so it gives you more time to trick it out. It’s important to maintain this mode, since it means you’ll get farther. 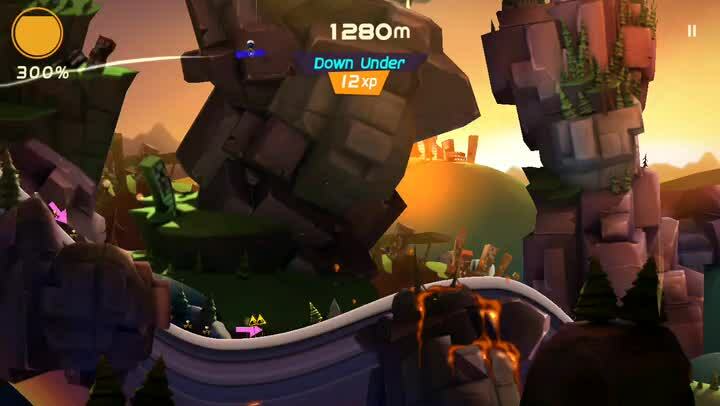 The controls in the game are simple, and remind me of the classic Tiny Wings. 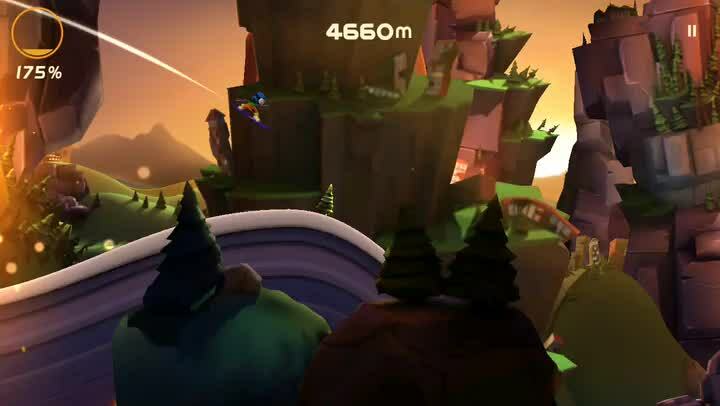 Just tap-and-hold on the screen when you want to gain momentum downhill, and release to glide effortlessly uphill. As you unlock tricks, you just swipe horizontally or vertically on the screen to perform them. Each trick you do nets you some experience points, so it’s good to chain together tricks for combos. But since the lava is right behind you, timing is everything when it comes to moving and performing tricks. 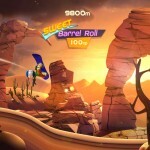 There are a lot of things that you can unlock in Rad Boarding, and these can be earned or bought. The coins that you collect in runs can be spent on upgrades for your character, making the apocalyptic journey a bit easier. There are also frogs that you can pop to get costume pieces and bottle caps for your collection. My biggest issue with the game is the fact that there is no Game Center integration. Instead, the developers chose to just use Facebook for leaderboards, which doesn’t make sense to me. The game is also riddled with ads throughout, as you’ll see after every run. At the time of this writing, Rad Boarding is also facing some server connection issues with some users, which includes me. They are aware of this, though, and are working on fixes. I wanted to like Rad Boarding, I really did. However, while the foreground graphics look fantastic, the background is not up-to-par, which is unfortunate. The music is also fun for the first few times, but then it is a bit repetitive, like the course — there isn’t much variation with each run. The ads are also a bit intrusive and annoying, and the lack of Game Center is a let down. I felt that the hype was a bit high up there for this game, which ultimately just ended up in disappointment. 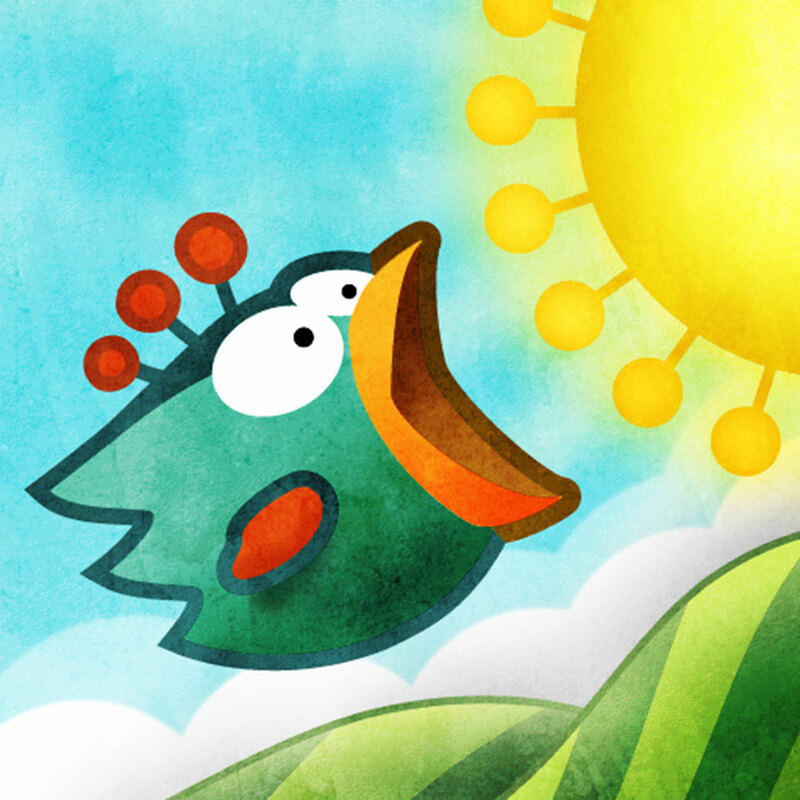 If you want to give the game a try for yourself, you can find it on the App Store as a universal download for free.